A fun filled myriad of sporting based events, making it an exciting team affair! A mix of crazy, engaging team based challenges! Silly Olympics means you need not be an Olympian to compete and experience this fun and challenging team building event. We can customise events to ensure all abilities are catered for and everyone can participate. Guaranteed to have your team laughing, enjoying the great outdoors and working together as a team – with amazing benefits for corporations. Maximum fun, maximum gain. Being silly has never been so strategic. A team-building event to promote healthy lifestyles, fun and participation for all. 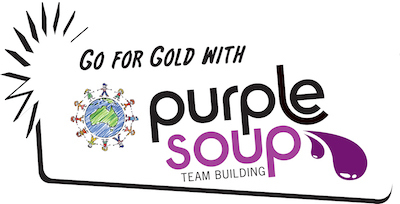 Purple Soup Team Building can customise this event to suit your team’s requirements including high quality medallions for first, second and third place teams that can incorporate your logo. Why choose Purple Soup’s Silly Olympics?